FOR USE IN CONCEALED HANDGUN LICENSE TRAINING." and the CHL has been converted to an LTC "License to Carry"
now that Open Carry is effective, as of Jan. 1, 2016.
updates for all the new changes. All changes to Edition 8, effective September 1, 2017. All changes to Edition 8, effective August 1, 2016. (Open Carry, 1/1/16), (Campus Carry 8/1/16) and more (9/1/15), click for separate descriptions. OpenCarryTexas.org and other pro-rights groups. Texas joins 44 other states in introducing open carry of firearms, for licensees only. Changes to Edition 8, effective Sep. 1, 2015. Texas gun laws continue to improve, thanks mainly to the Texas State Rifle Association. who attempt to ban gun owners by illegally posting §30.06 signs. Changes to Edition 7 that will appear in the upcoming Edition 8. Some are effective immediately, others take effect 9/1/13 or 1/1/14. a group you should join if you haven't already. what their gun laws were, comply with them, and campaign for better ones. "If you knew all your rights you might demand them." Texans did. preservation of the precious right to keep and bear arms. ISSUE DATE: March 30, 2002. HB 84. Penal Code 46.041. A felon may not possess metal or body armor. Possession by regular civilians is unaffected. HB 139. Penal Code 22.021. Sexual abuse is "aggravated" if the offense includes display or use of deadly weapon. HB 141. Penal Code 20.03. Kidnapping is a class 2 felony if serious injury is risked. Penal Code 20.04. Aggravated Kidnapping includes making a person a slave, abducting someone incompetent or under 17; change "him" to the politically correct gender-free term "the person abducted". HB 171. Penal Code 28.02. An arson offense occurs whether the fire starts or not; places of habitation or assembly are added. Penal Code 28.03. Arson and Criminal Mischief penalties are changed and "explosive weapon" is defined for use in this section. HB 780. Government Code 411.1999. Description of retired peace officers who are elligible for CHL is expanded. HB1118. Family Code 59.003. Delete "or (3)," of section (a)(2) to adjust penalty applicability. HB 1362. Penal Code 42.01. An exemption for using a firearm in defense against a wild animal attack is added to the Disorderly Conduct law. HB 1600. Penal Code 38.14. Attempting to take a peace officer's gun is a state jail felony, taking the gun is increased to a class 3 felony. HB 1837. Local Government Code, 250.001. Shooting range protection. The definition of a range is expanded to include private clubs and associations regardless of when they opened, and nuisance complaints are restricted. HB 1118. Penal Code 8.07. Change "he" to "the person" so no one is offended. HB 1925. Penal Code 46.03. Places where weapons are prohibited includes within 1,000 feet of a place of execution. Exceptions include driving on a public road, or while at home or at work. Penal Code 46.15. Proper authorities are exempted from the firearm ban within 1,000 feet of execution site. HB 2098. Penal Code 20.02. False Imprisonment penalty is increased if the victim is under 17 or a public servant. HB 2784. Government Code 411.047. DPS is allowed to maintain certain CHL statistics on its website, the stats allowed are described. HB 2812. Technical Corrections Bill. Non-substantive fixes, mostly changing citations, e.g. Texas Bd. of Private Investigators and Private Security Agencies is now Chap. 1702, Occupations Code. SB 199. Penal Code 46.04. Unlawful possession of firearms by felons is amended to add people with a Class A misdemeanor violation under Penal Code 22.01 (assault) within 5 years of release, and state employees under specified protective orders, except for police. Family Code 85.022. A court order can ban firearm possession, except for police. Family Code 85.026. The gun-ban statement required in certain court orders is changed to exclude police. SB 430. Occupational Code 1701.603. Gun safety training in schools is encouraged, may include NRA Eddie Eagle program and more. SB 904. Penal Code 37.08. False report to a peace officer investigating a felony is now a state jail felony, or a class B misdemeanor if the investigation is for a misdemeanor. SB 1174. Penal Code 28.03. Criminal mis-chief now includes penalties for tampering with public communication, public transportation, public gas or power supply, or other public service. SB 1368 (1999). Technical Corrections Bill. Changes the old CHL law designation of 4413(29ee) to Subchapter H, Chapter 411, Government Code. Previous announcements indicated the following bill was enacted, but it was vetoed by the governor and is not law. SB 1713. Penal Code 46.15. Nonapplicability would be changed so out-of-state police and certain special investigators in Texas would be exempt from gun bans on the public, the exact opposite of the original intent under the Constitution. This proposal was vetoed. and get free updates online! ISSUE DATE: January 24, 2000. The Texas legislature passed 27 bills on Texas gun law in its 1999 session. These have been included in the new 4th edition and are described here. Many typographical, pagination, positioning, grammatical and technical changes have been made and may not be noted. The page number from the prior book (Edition 3) precedes each entry. See the latest edition for full details. FFL=Federal Firearms Licensee (licensed dealers); CHL=Concealed Handgun License or Licensee. "Approved by the Texas Dept. of Public Safety for Use In Concealed Handgun License training." Page 2--Now the 4th edition Copyright 2000 ISBN # 1-889632-01-5 We are on the web at gunlaws.com. 3--Table of Contents updated as needed to match new text. 12--Substitute "people" for "citizens," to increase precision. 16--"The Second Amendment of coursemeans what it always used to mean, which explains the armed populace we observe today." Alcoholic Beverage Code, Business and Commerce Code, Civil Practice and Remedies Code, Code of Criminal Procedure, Education Code, Family Code, Government Code, Health and Safety Code, Local Government Code, Parks and Wildlife Code, Penal Code, Property Code. 19--Replicas of pre-1899 firearms that don't use rimfire or centerfire ammo are now excluded from the basic firearm definition. 20--A new "right" is introduced under Health and Safety Code §247.065 for operators of assisted-living facilities to maintain an environment free of weapons. 21--Certain protective orders must include a specified statement prohibiting guns and ammo for the person named in the order, see Family Code §85.026. It is a five-year federal felony to make false statements on a dealer's Federal Firearm Transaction form, and it's illegal to knowingly provide a firearm to a prohibited possessor. 22--The Juveniles section has been reworked and expanded. The federal cite requiring kids to carry written permission when involved with guns, even if they're with you, is 18 USC §922 (x). Under Family Code §54.0406, if a juvenile seeks probabtion for a gun offense, the child must inform on who provided the firearm. A child who acted delinquently with a firearm must be detained, see Family Code §53.02. 25--Since Brady Part 1 expired, the old process for buying a gun, with local law enforcement doing background checks has ended. Now, under Brady Part 2, Texas dealers must directly contact the FBI "NICS" system and get clearance before transferring a gun to you. Photo ID is required. The FBI can take up to three business days to respond, after which, if they don't, transfer may take place. Contrary to clear federal law, the FBI records the name and address of everyone purchasing a gun at retail in America. 26--You may buy and take possession of long guns from a licensed dealer in another state, in a face-to-face transaction. 44--States that allow non-residents to obtain a state carry license now include Arizona and Texas. Firearms taken on a common carrier must be legal at the destination of your trip. Though federal law requires written notice to the carrier, as a matter of practice, verbal notice is frequently accepted. 45--While it is legal to give cutody of firearms to the operator of a common carrier during a trip, they are not obligated to accept custody. 46--Special conditions were established to restrict government entities from suing gun and ammunition manufacturers or suppliers, in Civil Practices and Remedies Code §128.001. 53--Conditions for buying firearms from dealers have been updated to reflect changes made by Brady Part 2, described on p. 25 and 147. The CHL license exempts you from the NICS check. 56--The CHL law, which applicants must certify they have read and understand, was originally contained in Senate Bill 60, then Article 4413 (29ee) Revised Statutes, and now has been moved mostly to Chapter 411, Government Code, with some sections spread throughout Texas gun law as amendments and additions to existing statutes. 61--A driver's license is acceptable in place of a birth certificate. 62--Background checks must include county mental health records. 66--CHL renewal applications go to the Austin DPS HQ. 69--Reciprocity List: Under the new Texas reciprocity plan, deals have been cut with four states--Arizona, Arkansas, Louisiana and Oklahoma, making CHL licenses valid there, but only under those states rules, whatever that might be. 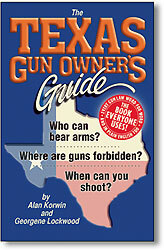 From the text: "Be extremely cautious in these states because they have laws and rules vastly different than Texas (and no practical method for finding out what they are, although there is an Arizona guide similar to this Texas edition, listed in the back). Instead of a protected right to keep and bear arms, your rights as an American have been reduced to a short list of government-approved states for licensees only, under the infringement of reciprocity schemes." 75--DPS issues statistics on CHL Law offenses, as required by Government Code §411.047. 77--A place that services alcoholic drinks (bring your own bottle), is included with places that serve alcoholic drinks, in the prohibitions for CHL carry, and a liquor store (or grocery store or similar) that sells packaged goods for off-premises consumption is not. Proper notice includes verbal or written communication, or posted signs. 80--All references to the CHL law, formerly Article 4413 (29ee) are now, generally, to Chapter 411, Government Code. The distinctions about liquor service, described for p. 77, apply on this page too. 81--Criminal trespass now makes a distinction for agricultural land as a class C misdemeanor, and Superfund sites have been added, as class B. The distinctions about liquor service, described for p. 77, apply on this page too. 101--Article 4413 (29ee) is now, generally, Chapter 411, Government Code. 127--Include §161.043 in the citation (the legislature split one law into two parts). Disarming a Peace Officer: "It's generally illegal to take or try to take an officer's weapon." It is a state jail felony to intentionally or knowingly, and with force, take or try to take a weapon away from a peace officer, parole officer, or community supervision and corrections department officer. However, there is a defense to prosecution if the officer was using greater force than allowed by law. See Penal Code §38.14 for the letter of the law. Criminal Mischief: "It's illegal to use a gun to cause property damage." It is a state jail felony to damage or destroy a home with a firearm or explosive weapon. Many other penalties apply depending on the amount and nature of the damage. See Penal Code §28.03 for details. Appointing and Arming Deputies: "Appointed deputies may only be armed as allowed by law." The Commissioners Court of a county may authorize the sheriff to appoint reserve deputy sheriffs. The sheriff may authorize all reserve deputies to carry firearms when on official duty, and in the case of a reserve deputy who is already a peace officer as defined by law, may authorize carry when not on duty. Similar conditions apply to reserve deputy constables and reserve police officers, as defined in Local Government Code §85.004. 145--The list of federal gun laws now includes the Omnibus Consolidated & Emergency Supplemental Appropriations Act, 1999 (numerous requirements detailed later). 5--A mechanism for preventing known criminals from directly purchasing firearms at retail and paying sales tax. The widely publicized five-day waiting period was largely a myth, and never existed in most states (in Texas the "wait" ranged from zero to nine days as a local check was conducted). The effect of the Brady law on crime reduction is essentially unknown, since the 400,000 criminals reportedly identified by the system (the number is hotly disputed) are on the loose--virtually no effort to track or apprehend them has been made. It is a five-year federal felony for criminals and other disqualified persons to attempt to purchase a firearm. Part 1 of the law, the handgun part, set to expire 60 months after enactment, is described in small type (it expired Nov. 30, 1998). Brady Part 2, the National Instant Background Check (dubbed NICS by the FBI, who has replaced BATF to operate the system), controls rifles, shotguns and handguns, and is described as it appears in the federal statute. Complex regulations to implement the new law, which are basically transparent in this state, are not covered (available in their entirety on the FBI and BATF Internet sites). The FBI's use of the Brady NICS computer system to record the name and address of every retail gun buyer in America, in apparent violation of long-standing law (strictly forbidden in both the McClure Volkmer Act, 1986, and the Brady law itself), has prompted outcries from the public and Congress, but continues unabated. In addition, the Justice Dept. seeks to levy a tax on the sale of firearms, and give the funds to the FBI, with no apparent authority to do so (taxes are supposed to originate in Congress). States agreeing to cooperate with the FBI (Texas has not), might avoid the dealer tax if one is implemented. For updates and detailed analysis of the complex Brady machinations, check our website, gunlaws.com. The Brady Law Part 2--National Instant Check: The Brady Law requires the U.S. Attorney General (AG) to establish a National Instant Criminal Background Check system (NICS) before Nov. 30, 1998 (which they did). With NICS now in effect, the previous process (above, in small type) is eliminated. In order to transfer any firearm, not just handguns, with the NICS system in place, a dealer must verify your identity from a government-issued photo-ID card, contact the system (based in Clarksburg, W. Va., run by the FBI), identify you and either: 1--get a unique transfer number back from the system, or 2--wait three days during which state offices are open and during which the system provides no notice that the transfer would violate relevant laws. Some states have been designated "Point of Contact" states by the FBI. This means dealers there contact the State Police for all gun sales. The State Police include a check of the FBI's NICS system, and the process is transparent to the customers. In Texas, as in most states, the dealer must contact the FBI directly, which conducts both the federal and state checks. The NICS system is required to issue the transfer number if the transfer would violate no relevant laws, and it is supposed to destroy all records of approved inquiries except for the identifying number and the date it was issued. The FBI, however, has indicated they are recording the name and address of everyone who buys a gun now that the system is running, and Congress has been unable to stop them so far. If the transfer is approved, the dealer includes the transfer number in the record of the transaction (on a redesigned version of the 4473 form). The NICS system is bypassed under conditions similar to 2, 4 and 5 listed above (in small type) as exceptions to the Brady process (with number 2 broadened to include "firearms" permit). A licensed dealer who violates these requirements is subject to a civil fine of up to $5,000 and suspension or revocation of their license, but, according to the statute, only if the system is operating and would have shown that the customer would have been ineligible to make a purchase. Dealers, fearing federal reprisals against their licenses and livelihoods, have generally been unwilling to do business when NICS is down, which has occurred constantly through technical glitches and from planned "maintenance periods" during regular business hours. Essentially, as of late 1998, federal forces have gained control of all retail gun sales in America. The only sales not controlled by federal agents are lawful private transfers among the people. This basic American freedom is now being attacked as a "loophole," ironically, by officials we elect who take an oath to preserve, protect and defend the Constitution. If you are denied a firearm under NICS, the law says you may request the reason directly from NICS and it must present you with a written answer within five business days. You may also request the reason from the AG, who must respond "immediately," according to the law. You may provide information to fix any errors in the system, and the AG must immediately consider the information, investigate further, correct any erroneous federal records and notify any federal or state agency that supplied the errors. 151--Purchase and possession of firearms by people under domestic violence restraining orders is prohibited (although this is now the subject of a court dispute, whether a routine procedural order can abrogate civil rights, in Emerson v. U.S., 5th federal circuit). 158--Omnibus Consolidated & Emergency Supplemental Appropriations Act, 1999. This 4,000-page budget bill was secretly drafted in committee, rushed to the floor of Congress, voted on two days later, and enacted in October 1998 without any of your representatives actually reading it. It increased federal gun law by almost 6%, with provisions for NICS funding, gun-law enforcement funding, gun safety devices sold at retail, public gun safety training funding, restrictions on aliens, NICS record-keeping and taxing prohibitions, shotguns and certain antiques redefined, undetectable gun law reenactment, relief for importers, a pawn shop NICS glitch fix, the Arms Control and Disarmament Agency disbanded with duties moved to the State Dept., and a special ban on using the U.S. global arms control and disarmament agenda against the public. Complete federal update is posted on our website. 161--Chart of "Growth in Federal Gun Law" has been updated through 1999. 193--Intoxication is now 0.08 alcohol concentration, tolerance for truckers is zero. 197--Added a few offenses to the list in the punishment chart, where space permitted. HB 436 Trespass on agricultural land HB 525 U. S. Forest Service authority HB 592 Instructor background checks HB 635 Taking weapon from peace officer HB 668 Street gangs HB 690 Criminal mischief penalties HB 957 Conditions for arming deputies HB 998 Burglary includes assault HB 1265 Carry on Superfund site penalty HB 1269 Detention of armed delinquents HB 1428 "Restrain" redefined HB 1933 CHL mental check and fees HB 2231 Rail-car burglary definitions HB 2825 Antique, curio, relic and black powder arms HB 2869 Probation conditions for kids with guns HB 3517 Sanction levels for armed juveniles SB 24 Repetitious assault on family SB 43 Reporting gunshot wounds SB 50 Protective order gun and ammo notification SB 93 Gun-free assisted living facilities SB 131 Hospital 51 sign exemption SB 152 Escape by juveniles SB 370 DPS statistics on CHL SB 404 Peace officer CHL after retirement SB 717 Conditions for government lawsuits against gun companies SB 1368 Technical corrections and overhaul of Chapter 411 (CHL law) SB 1558 Criminal trespass includes aircraft HCR 57 Children's Firearm Safety Week. 203--Replace paragraph: 3--The Right to Carry law, enacted in 1995 as Senate Bill 60, which created the concealed-handgun license. This was codified initially as Texas Civil Statute 4413(29ee), and as changes to a number of other existing statutes. It has been amended several times, and is now basically codified under Government Code Chapter 411. The laws in Appendix D are effective as of 9/1/99. 205--All statutes have been updated to reflect the 1999 session. There were lots of changes all over the place. The government expects to have this work done and online in about 6 months (mid-2000). 262--Senate Bill 60 is now, basically, Government Code chapter 411, and other sections of the law. 282--The back matter has been refreshed. We now carry gun-law guides for eight states, plus federal, 50-state travel and CCW guides, and we're on the lookout for any others you may know about! Call us. GET THE LATEST EDITION TODAY! EASY PHONE ORDERS 1-800-707-4020 and at stores everywhere! Permission to circulate this update for non-commercial purposes is granted. NEW FEDERAL GUN TAX FOR TEXANS? (Nov. 1998) Under the general banner of crime reduction, and citing the Brady law for its authority, the FBI plans to tax the retail sale of handguns and long guns, starting Nov. 30, 1998, if their new computer systems are ready in time. The proposed tax could generate $1 million per week nationally, based on the bureau's estimates. Detailed information is included in a report just issued by Phoenix-based Bloomfield Press, a book publisher specializing in gun law [Ed: Summary of Findings on request]. Perhaps more significant than a surprising new tax from the Justice Department--without any apparent Congressional approval--is the FBI's announced plans to record complete identifying information on every person who purchases a firearm from a licensed dealer. Any regulation that requires such recording has been prohibited under the McClure-Volkmer Act since 1986. Neither the tax nor the gun-buyer registration scheme appear to be legal, according to Alan Korwin, best-selling author of The Texas Gun Owner's Guide. Korwin has written six books on gun law, and his Texas guide is officially approved by Texas DPS for concealed handgun license training. The FBI intends to waive the tax for any state that sets up an FBI-approved central firearms clearance center, as 20 have already done. In other states, such as Texas, each dealer will have to "enroll" with the FBI to legally make a sale, and pay the tax on every purchase. The Bureau will accept credit cards or will arrange to bill dealers, and those who don't pay (or are real late on the invoice) will be literally out of business. Several authorities have indicated that they expect enough clamor from the taxed dealers to compel their states to comply. When 100 Arizona dealers were told at a government meeting earlier this month, that they would not be taxed, they cheered. NOTE: The FBI and their taxing scheme described above were defeated nationwide. The book Texans use for the rules on bearing arms has been officially approved by the Texas Dept. of Public Safety for use in concealed handgun license training. Widely used by DPS officers, instructors and gun owners since its release in 1995, The Texas Gun Owner's Guide includes all Texas gun laws (not just the Penal Code sections given to licensees), and most importantly, describes all the rules in plain English. The approval is seen by the book's publisher as a step toward ensuring Texans' rights and responsibilities. Despite controversies surrounding firearms, half of all homes contain at least one firearm, according to the FBI. · It doesn't make sense to own a gun and not know the rules,-- said co-author Alan Korwin in a recent interview. · These days, the legal risk to you in case of a criminal attack is so great that you simply must have a grasp of the laws.-- This may not be just, but it's true, he said. · Please, start using the laws we have before enacting any more. Every criminal act imaginable has already been outlawed.-- The Texas Gun Owner's Guide, in an arena that anti-rights activists decry as unregulated, is now 288 pages, reflecting a 7% growth in state gun laws last year, to 41,360 words. To fire up a copy of the $14.95 paperback [free to media reviewers] call 1-800-707-4020 or visit bloomfieldpress.com. only summarized here. See the latest edition for full details. FFL=Federal Firearms Licensee (licensed dealers); CHL=Concealed Handgun License or Licensee. 2 - Officially DPS approved (see above); Copyright 1998; change print code line (backwards series of numbers at page bottom that identifies the edition number) to "3," include fax and website, new ISBN 1-889632-03-1. 3 - Table of Contents reflects changes and 32 new pages. 15 - The word citizens has been changed to people in many places in the text for precision. 21 - Federal prohibited possessor list now includes people convicted of misdemeanor domestic violence. 22 - It's important to note that new federal law requires your minor children to carry a written note from you when they go shooting or handle guns, even if you are accompanying them. 24 - Federal definition of dealer has been added. The material about obtaining guns in- and out-of-state has been reorganized and fine-tuned for precision, and to reflect result of the Supreme Court Brady Law decision (which was nil in Texas, though record-checking fees now charged by many departments are not required by any law). 27 - One of the greatest changes in 1997 is the re-write of Penal Code §46.02 and §46.15, the main laws controlling handgun carry. §46.02 shrinks to just a few lines, prohibiting the carry of a handgun. All the exceptions to the prohibition are now in §46.15, which says §46.02 "does not apply" if you're in one of the protected groups or circumstances. The abusive affirmative defense standard, which lead to countless unnecessary arrests of law-abiding people has been dropped. 36 - Only long guns may be shipped through the Post Office, under one of the oldest federal laws on the books (1927). (The oldest federal law still on the books is a hunting restriction for Yellowstone National Park, from 1894; the oldest federal gun laws, from the late 1700s, actually required gun possession.) Any handgun obtained (not just purchased) outside Texas must be shipped from and to an FFL, you can't bring it in across state lines on your own; only a long gun, bought face-to-face from a dealer, can be brought back directly. A new section clarifying Interstate Travel has been added. 37 - Reciprocity Laws in General: A national movement is afoot to ease the stranglehold that state laws have placed on law-abiding travelers. Introduced at state and federal levels, reciprocity laws seek to guarantee that people who may legally carry in their home states cannot be held in violation when in another state. It seems that the Second Amendment is providing no protection for travelers, and a legislative solution is being sought. Your home state's rules would not apply when you go "abroad." You would be subject to the laws, regulations and customs of the state you are in at the time. Most proposals seek to obtain this relief only for individuals with government-issued permits. Supporters typically cite Article IV of the Constitution, known as the full faith and credit clause, which says in pertinent part, "Full Faith and Credit shall be given in each State to the public Acts, Records, and judicial Proceedings of every other state;". This sets a model similar to marriage and driver licenses. Other attempts seek to allow any person who is not acting criminally to be free from harassment or arrest for simple possession of a legally owned firearm, independent of the state involved. This would emulate the way people are basically free to speak their minds regardless of their location (and no license to exercise the First Amendment is available at this time, except that broadcasts are forbidden without a government license). Some states take the approach that, if your permit is similar to ours, and your state formally honors ours, then we will honor yours. A method is then set up to determine if the two states' requirements are a rough match. Such comparisons are problematic because they once again subject your rights to bureaucratic review, as in the days before "shall issue" permits, and indeed, states have already experienced difficulty in agreeing if their "standards" are a match. When the officials decide there is no match, they remove the right to carry between those states. To link all 50 states to each other and thus restore rights to properly government-licensed individuals would require 1,225 pacts (49 + 48 + 47... etc.). Each state's requirements are of course different. Studying the laws of your home state (a common requirement) hardly prepares you and is certainly not a match for the laws in any other state. Florida requires no shooting test for its permit, Virginia asks for proof of demonstrated competence with a gun but does not define it further, Texas requires 50 shots at three distances with all shots timed, Arizona requires seven hits out of ten, and so it goes, state to state. Some states are considering honoring anyone who has a state-issued permit. Some will issue a permit to anyone qualified, resident or not, getting around the problem in yet another way. A handful of states have no permit system, presumably leaving them out of the picture when their residents are on the road, or for you when you visit. A few have introduced laws that would allow you to drive through their states on a "continuous journey," or to enter the state but only for a competition or designated event. A federal bill seeks to require all states to honor the permits of all other states. Residents in Vermont are excluded because they need no permit to carry in the first place. The 98% of Americans who bear arms but have refused to sign up for a government carry-rights permit are also left out of these plans. Rumors are swirling about which state has adopted what policy, and relying on a rumor where no rule exists can get you arrested. Viewing the printed statute yourself is a good way to help avoid rumors. Laws may offer less protection when new, before street police policy is set and well known throughout the law enforcement community. It would be nice if there was a rock-solid reliable place to call to find out exactly where reciprocity exists, but there is none at the present time. Besides, a complete answer with precisely all the do's and don'ts is more than you can possibly get over the phone. The job of telling you is not the role of the police, the sheriff, the DA, the AG, the library or anyone else. One solution that addresses these problems is the proposed American Historical Rights Protection Act. This basically says that if a person has a gun, the person isn't a criminal, and the gun isn't illegal, then that is not a crime, based on the 14th Amendment. For a copy of this draft statute contact Bloomfield Press or visit our website. Four states currently have some form of recognition for out-of-state permit holders--check with them for details: Idaho, Indiana, Michigan and Wyoming. These states have passed laws that would allow some bureau within the state (indicated in parenthesis) to cut deals with a bureau in another state, or they have set up other conditions that might lead them to recognize each other's permits--check with them for details: Arkansas (State Police), Connecticut (Commissioner of State Police), Georgia (County Probate Judge), Kentucky (Sheriff), Louisiana (Deputy Secretary of Public Safety Services), Massachusetts (Chief of Police), Mississippi (Dept. of Public Safety), Missouri (residents currently prohibited from concealed carry), Montana (Governor), New Hampshire (Chief of Police), North Dakota (Chief of the Bureau of Criminal Investigation), Oklahoma (State Bureau of Investigation), Pennsylvania (Attorney General), Rhode Island (Attorney General), South Carolina (Law Enforcement Division), Texas (Dept. of Public Safety), Utah (Dept. of Public Safety), Virginia (Circuit Court), West Virginia (Sheriff). The different authorities named in this list are a measure of the consistency of the laws from state to state. Some states will issue firearms permits to non-residents if you qualify--check with them for details: Florida, Iowa, Maine, New Hampshire, Pennsylvania, Rhode Island, New Jersey, Utah, Washington and Wyoming. If, after reading these lists, you sense that reciprocity schemes don't solve the problem and unshackle honest citizens, well, you're not alone. The Texas Version of Reciprocity is described in Chapter 2 (See note for pg. 61). 38 - It's legal for a pilot, captain, conductor or operator of a common or contract carrier to take custody of your weapon for the duration of a trip, but they're not required to do so. 41 - The Lost National Right to Carry has been expanded, and melded into the sections on Transport and Interstate Travel. 47 - The Brady paperwork form is required for handgun purchase from a dealer, a CHL exempts you from the process, dealers must submit forms but law enforcement is not required to conduct background checks, and no law empowers police to charge you for background checks. 49 - Delete affirmative defense since this requirement has been removed from the law. Change unlicensed citizen to unlicensed people. 50 - Change resident to person. Failure to show your CHL on request, if you are armed, makes you subject to a 90-day suspension, or a class B misdemeanor for a second offense. 51 - License suspension for arrest or indictment lasts until the matter is resolved. DPS has determined that a written exam may not be substituted for classroom instruction for a CHL. 52 - Certain non-residents may now apply for a CHL. A felony conviction does not prohibit you from a CHL if the conviction was expunged or properly pardoned. The definition of unsound mind has been refined by law, involving specific medical or psychological conditions. Qualification now refers to ability to exercise sound judgment for proper use and storage of a firearm. The Texas Medical Advisory Board must cooperate in making determinations if requested by authorities. 54 - Fingerprints may now be taken by a properly authorized private party (formerly DPS only). 55 - The CHL application and denial time frames, and notification requirements, have been altered, changing certain time periods and lengthening the outside limits to 210 days maximum for a worst-case-scenario denial. This was a complex change that required hours of deciphering and two pages of text to explain clearly (though once explained it's not really that bad). This change continues through page 57. 56 - Texas residency no longer applies to qualified non-residents who seek a license. If your instructor disapproves your license, DPS must make sure the denial was made for good reason and in good faith. 58 - CHL renewal process has been established; basically, it's a 4-hour class (instructors set the price), another marksmanship test (same course of fire), two color photos, forms, and a $70 fee ($35 for seniors and indigent). DPS to send you a renewal form, new license is good for four years. Texas gun law grew by 2,661 words in the 75th (1997) legislature, to 41,360 words, a 7% increase. 59 - License suspension: For a first offense, your license may be suspended: 1 - Until charges are dismissed if you are charged with a class A or B misdemeanor; 2 - Until charges are dismissed if you are charged with disorderly conduct under §42.01; 3 - Until charges are dismissed if you are charged with a felony under an information or indictment; 4 - For 90 days if you fail to show your license to authorities when required to do so; 5 - For 30 days if you fail to notify DPS within 30 days of a change of name or address, or of a lost, stolen or destroyed license; 6 - For 30 days if you carry a firearm that doesn't match your license category (the revolver and semi-auto distinction); 7 - For 30 days if you don't return an old license after a modified one is issued. The suspension for a second offense may last from one to three years, and a third offense (for the same violation) is grounds for revocation. 61 - Texas Reciprocity Law and Non-Resident Licenses. The misleading nature of so-called reciprocity laws is discussed (see p. 37). The first Texas reciprocity law, enacted as part of the Right-to-Carry law in 1995, never lead to any reciprocity. This was replaced with a new version, enacted in 1997. Under the current version, non-Texans who come from a state where no concealed-carry law exists, may qualify for a Texas CHL if they meet all the requirements except for Texas residency. DPS is required to set up a procedure for accomplishing this, and charging a fee to cover costs. Contact them directly for details. The department is also required to negotiate agreements with states that have their own concealed-carry license procedure, to recognize those licenses if: 1 - The other state's background check requirements for a license meet or exceed the federal requirement to receive a handgun; and 2 - The other state recognizes a Texas license. DPS is required to get this started by Dec. 1, 1997. 63 - Minimum handgun caliber for CHL marksmanship test is now .32. 65 - An instructor CHL (on top of the instructor certification fee) now costs $100. Instructor certification renewal is $100 and requires an 8-hour course. 66 - Minimum handgun caliber for CHL marksmanship test is now .32. 68 - Retired and active peace officers may obtain a CHL. 69 - 73 Prohibited Places List (and Bars) saw numerous technical changes because of massive restructuring of the statutes (see notes for pg. 27, above), and many substantial changes because of trespass and posted sign requirements. Also note that §46.03 prohibits bringing or having a firearm in its specified prohibited places, and racetrack probably includes any paid parking on site. Certain places are only prohibited to CHLs if properly posted (amusement parks, places of worship, government meeting places, hospitals, nursing homes), and private places open to the public (to prohibit CHLs under new trespass law). B - You are notified that staying on the premises with a concealed handgun is forbidden and you do not leave. Property owners have explicit rights and control the terms by which others may enter their property. Access to a private residence is legally under near-total control of the resident, with no need for posting signs or other regulations. Places open to the public may not discriminate and are generally subject to the sign requirements. No-Guns-Allowed Signs: Four new laws define what a no-gun sign must look like, and how to give 'proper notice' that guns are prohibited at a public place. A - For the purpose of the CHL trespassing law (§30.06 described above) and for the CHL restrictions in §46.035, you have "received notice" when the owner (or someone with apparent authority to act for the owner) gives you notice either orally or in writing. If it's in writing it may be handed to you, or prominently posted in English and Spanish on the property, in contrasting-color block letters at least one inch high, with this precise message: "Pursuant to Section 30.06, Penal Code (trespass by holder of license to carry a concealed handgun), a person licensed under Article 4413(29ee), Revised Statutes (concealed handgun law), may not enter this property with a concealed handgun". Any place open to the public could post such a 'thirty-ought-six' sign to restrict CHLs. If a hospital, nursing home, amusement park, place of worship or government meeting does not post such a sign (or give written or oral notice), then properly licensed CHLs are not prohibited from entering. B - A business with a liquor license or permit, which gets 51% or more of its income from the sale of alcohol for consumption on the premises, must conspicuously post a sign at each entrance, in English and Spanish, that it is unlawful for a CHL to carry a handgun on the premises. The sign must be in contrasting colors with block letters at least one inch high, with the number "51" in solid red at least five inches high. (see Art. 4413(29ee) Sec. 31). C - Any place with a liquor license or permit that doesn't have to post a "51" sign (in other words, they get less than 51% of their income from drink sales) must post a sign that says it is unlawful to carry a weapon on the premises unless you have a valid CHL permit. The basic idea here is to make bars off limits to everyone, but to allow CHLs to enjoy a restaurant even if it serves alcohol (and it's illegal for a CHL to get drunk while armed). The sign must be at least six inches high and 14 inches wide, in contrasting colors, and conspicuously displayed. The liquor authorities can require a language in addition to English if they deem it necessary. (see Alcoholic Beverage Code §11.041 and §61.11). To summarize, there are three possible signs: 1 - The thirty-ought-six sign to exclude CHLs based on trespass law, 2 - The big red "51" sign that prohibits all guns in bars, and 3 - The "CHLs welcomed here" sign that allows CHLs into places that serve alcohol but get less than 51% of their revenue from drinks. 73 - Federal Facilities has a cross-reference to the reenacted Gun-Free School Zones law in chapter 7. Despite its clear wording, it's not clear if other lawful purpose would allow a CHL (or any other lawful possession) in a federal facility. 80 - Destructive device does not include regular shotguns with bore over 1/2-inch. Weapons and accessories affected by the Public Safety and Recreational Firearms Use Protection Act (1994, often and inaccurately called the Crime Bill) have been dubbed assault weapons by the media. 91 - Special conditions for posting various places have been introduced, described above at pg. 69. Four laws now affect this: 30.06 (Penal), 4413 (29ee) (CHL), 11.041 and 61.11 (Alcohol). Text on public and common nuisance offenses have been combined. 99 - Private firearms are prohibited at military installations by practice, not statute. 100 - Substantial change to the federal Civilian Marksmanship Program is summarized and cross-referenced to chapter 7. 101 - Travel exemption is now in Penal Code §46.15 (was §46.02). 108 - The important plain-English expression shoot to kill has been explained in greater detail. Some readers apparently would prefer the phrase didn't exist, and DPS always teaches shoot to stop, control or neutralize; the legal intent is to protect, not to kill, when using lethal force, a paradoxical point which can be discussed at great length. Shooting at another human being is a last resort, best reserved for only if and when innocent life truly depends on it. If it doesn't, don't shoot. If it does, don't miss. 111 - Self-defense justification includes defense of life or defense against serious bodily injury. For clarity, in the last item on the page, change go to to seek and bring along to have. 114 - For clarity, at the end of the third paragraph from the bottom, change serious to substantial and insert serious before bodily. 117 - Move Common Nuisance to pg. 91. Add new sections on Warning Shots (typically a very bad idea, not justified by law), Bullet Proof Vests (legal to own and wear), and Keeping Control of Your Firearm (discussing the risk of civil liability for letting someone get your gun without your OK). 129 - Several federal attempts to register guns and gun owners nationwide have been made despite laws forbidding this; the FBI stores fingerprints from all background checks until you are 99 years old. 131 - Three new federal gun laws: Promotion of Rifle Practice and Firearms Safety Act (1996), Antiterrorism and Effective Death Penalty Act (1996), Omnibus Consolidated Appropriations Act for FY 1997, (Domestic Violence Gun Ban, Gun-Free School Zones). New chart shows growth of federal gun law since 1791. 133 - U.S. Supreme Court overturned the federal mandate requiring local law enforcement to conduct Brady background checks (many are doing checks voluntarily, which could let handgun purchasers get their merchandise early if the check is completed before the maximum time (as much as nine days), which buyers would otherwise have to wait out. No authorization exists under federal or state law to charge you for the voluntary checks. 134 - Texas CHL exempts you from the Brady paperwork and delays. 135 - If and when the Justice Dept. gets the National Instant Criminal Background Check system up (as early as Nov. 30, 1998, though indications are it is way behind schedule) the Brady system will include long guns (takes effect 30 days after the U.S. Attorney General tells all FFLs that the national system is in place). The previous waiting process would be eliminated. 136 - Delete the notes about BATF refusal to recognize Texas CHL as an exemption from the Brady law. 138 - Detailed plain-English descriptions of the new federal gun laws (named on pg. 131, above) fills seven pages. There has been no known enforcement of the terrorism or school zones law (the hubbub over their passage belied any actual effect of these laws), but the gun ban for misdemeanor domestic violence offenses has created havoc in criminalizing (and disarming) many people in law enforcement, the military, private individuals, and for its eight apparent gross constitutional violations (described in detail in the new 3rd edition). 175 - Failure to show CHL is now a misdemeanor on 2nd offense. 179 - Some phone numbers for DPS have been changed. New CHL hotlines: 512-424-5750, 800-224-5744. 181 - Appendix D (the statutes) has been completely updated and revised to include new legislation for 1997. Back Matter revised, we now have The Traveler's Guide to the Gun Laws of the 50 States ($9.95 +S&H) and coming soon: Supreme Court Gun Cases with analysis by David Kopel and Stephen Halbrook.